Enclosed Patio Ideas... No Reason Not to Enclose. Enclosed patio ideas are becoming very popular as more and more people want outdoor living spaces. The reason that enclosed patio ideas are so popular is because people want a clean, shaded, bug free environment that will allow them to enjoy the outdoors. With more information about sun damage, there's no reason not to consider an enclosed patio! A sunroom is a great enclosed patio idea that will allow you to enjoy the outdoors in style. A sunroom generally has windows, but is entirely enclosed. Many people even choose to heat and air condition their sunroom, so that it really is an extension of the home. Gardens planted right outside the sunroom enhance the outdoor experience. Comfortable furniture, ceiling fans, and garden windows will really bring together a great enclosed patio idea that anyone would love! A screen porch is also a functional enclosed patio idea. A screen porch does not have windows, but is typically fully enclosed with screen to keep bugs and leaves out of the area. This enclosed patio idea can be built right onto the home, or can be in the middle of your yard to overlook a garden, pond, lake, or river. A screen porch will protect you from the sun, but in cold weather you'll still find that the screen porch is unusable because there is no protection from the chill of the outdoors. A finished porch is a very typical type of enclosed patio idea that is used in the Northern part of the country. Because many of the colder climates cannot be outdoors a good deal of the time, finished patios or porches are very popular. These enclosed patio ideas are actually built with insulated walls, windows, and doors to provide an outdoor living experience without actually going outside. This is different from a sunroom because it is built with the same quality products as you would build the rest of your home. An enclosed patio such as this will add square footage and value to your property now and into the future. 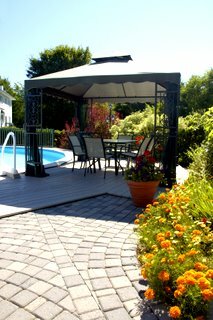 If you want more portable enclosed patio ideas, you can always opt for a canopy. The canopies that are sold today often will screw right into your patio and then there are zippered nets that will enclose the area and keep the bugs out. These canopies can be bumped right up against the house or can be placed in the middle of your yard, wherever you want the enclosed patio to be. 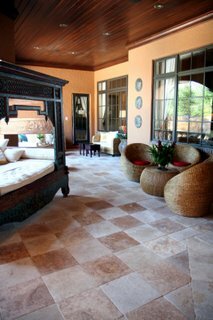 This is also the most inexpensive of the enclosed patio ideas, and can be taken down and moved with you. A visit to your local home store will help you come up with many enclosed patio ideas that you may not have considered before. What you choose will depend on the space you have, your budget, and whether you want to tackle the project yourself or hire professionals. Overall, enclosed patio ideas are appealing because they offer an extension to your current living space!